Today was the first really warm day we’ve had since October. It’s been a long winter, and my garden is as eager to reach for the sun as I am. The crocus’ popped open today (sorry it’s such a lousy picture). I planted them all over the garden in the fall of 2013, hoping that they’d provide an early meal for pollinators. 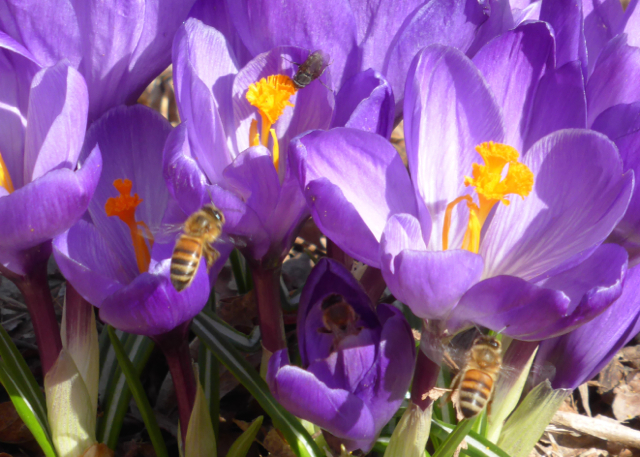 I was delighted to see that it worked – the purple crocus’ especially were crawling with excited wild honeybees and native bees and even flies. No bumblebees though. Not yet. The white crocus’ had a few visitors and the yellow ones were pretty much ignored. Interesting. I know that the colour purple attracts more pollinators – the ultraviolet in the petals stands out, making them easier to see. I wonder if there’s a flavour factor though. Maybe yellow crocus’ just don’t taste as good.